Welcome to bar that’s like Livorno itself – shabby, feisty and authentic as hell. It is also the spiritual home of ponce, a miraculous combination of coffee and rum. The walls of Bar Civili are covered with old black and white photos of Livorno as well as paintings presented to the bar by local artists to pay off their drink tabs. The most famous is a painting of the harbour at sunrise by Renato Natali. Natali was one of Italy’s most famous post-Macchiaioli artists. Judging by the number of his paintings on the walls he was also one of Livorno’s biggest lushes. The drink of choice is ponce, a mispronunciation of the word ‘punch.’ When the English Royal Navy dumped a consignment of particularly rough rum down at the docks in 1890 an enterprising local added coffee and two teaspoons of sugar and ponce alla livornese was born. Aficionados take their ponce ‘con vela’ – with a sailor. The sailor isn’t the salty sea captain holding up the bar. It’s a piece of lemon peel. The Livornese reckon it looks like the skin of a sailor just back from a tour of duty to the Antilles. 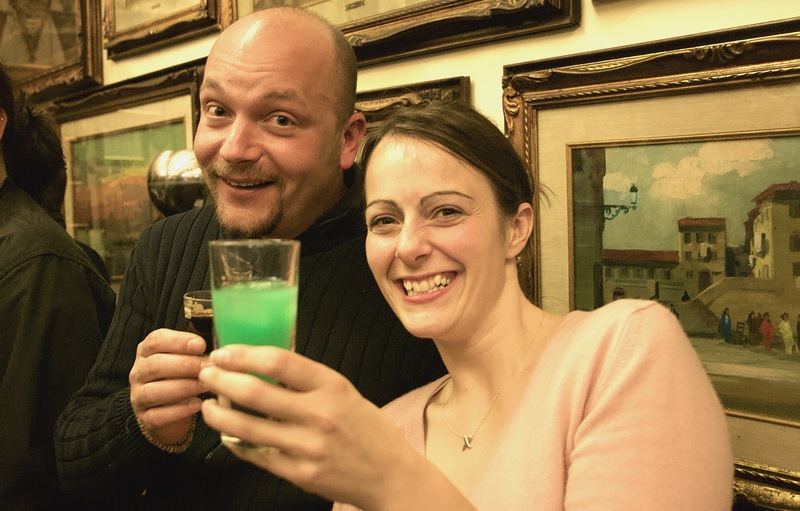 The ladies of Livorno prefer to drink Persianna, a startling green liquor that appears as though it may be radioactive. It is particular to Livorno too, and takes its name from the colour of the window shutters on the buildings that line the ancient canals. Thankfully it is not as lethal as it looks. On any given night you’ll see cool girls clutching Gucci hand bags, old guys in flat caps and breeches playing cards and the odd football fan looking for a stiff drink after another disappointing performance by the local team out at Stadio Armando Picchi. In that way Bar Civili is a microcosm of Livorno itself – pragmatic, open-minded and buzzing with brio. The low wooden beams in Bar Civili are covered with football pennants from all over the world. If you present the manager with one from your club he’ll give you a ponce on the house. On my last visit I gave the manager a ridiculously large Nottingham Forest pennant. He took one look at the tricky tree logo and the word ‘Forest’ and asked if they had been named after Forest Gump. News of our extraordinary exploits in Europe in the late seventies must not have reached this part of Italy. Bar Civili is not in the most convenient location. It’s tucked away on a tiny lane, down near the train station. But it’s worth the trek. There’s a reason it has been voted Livorno’s #1 Nightspot on Trip Advisor.